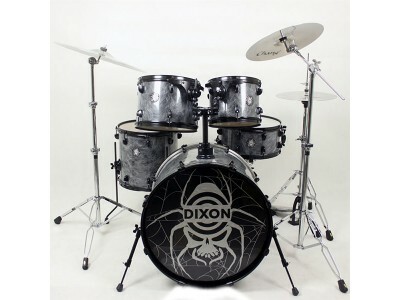 Dixon's Spider Black Widowdrums, said to be inspired by 'heavy metal rock', are (unsurprisingly)specifically designed to appeal to the metallers among us. 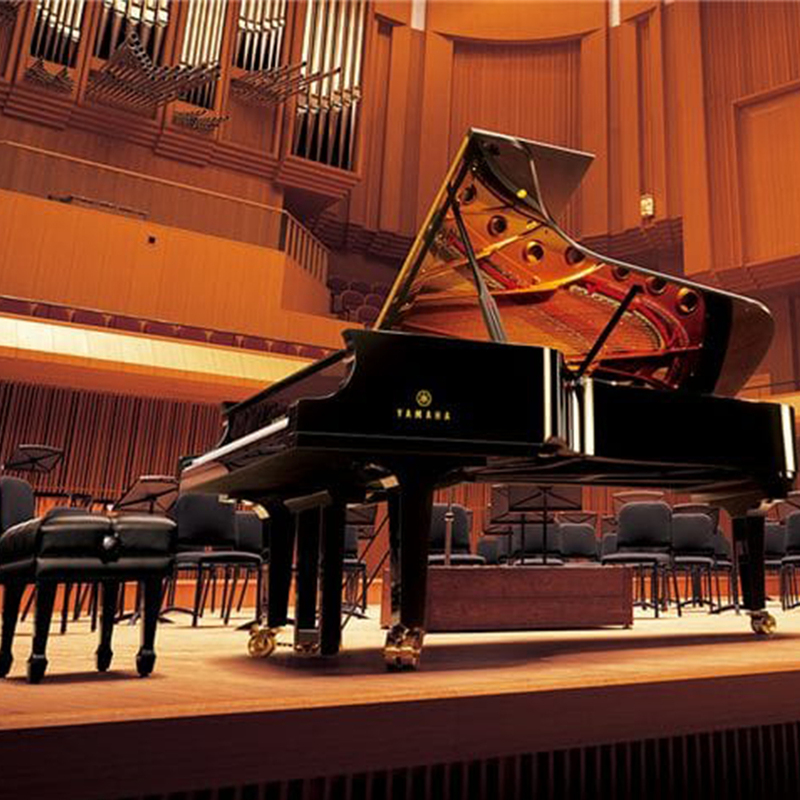 Deliverying sharp and attactive sound, good for variety of sites and gigs.This cunning mix of hardwoods delivers a balanced blend of tone and projection. 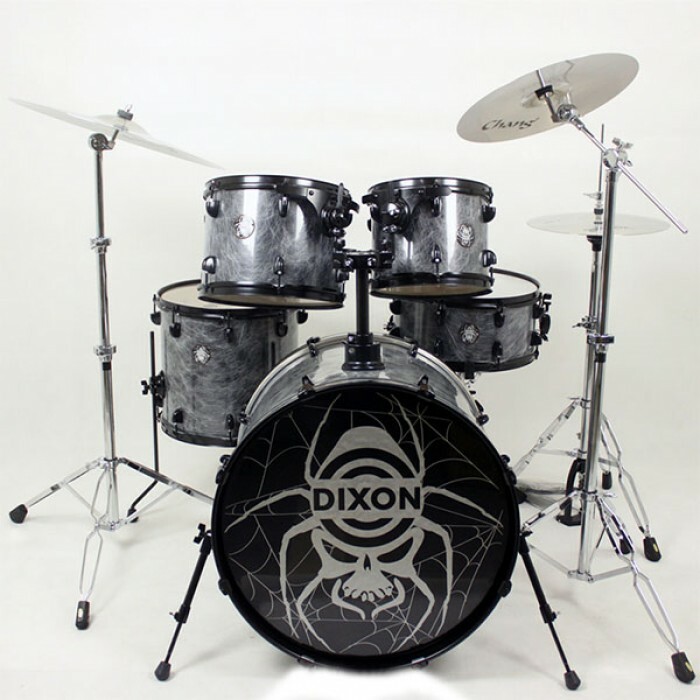 Dixon's new Black Widow drums, said to be inspired by 'heavy metal rock', are (unsurprisingly) specifically designed to appeal to the metallers among us. 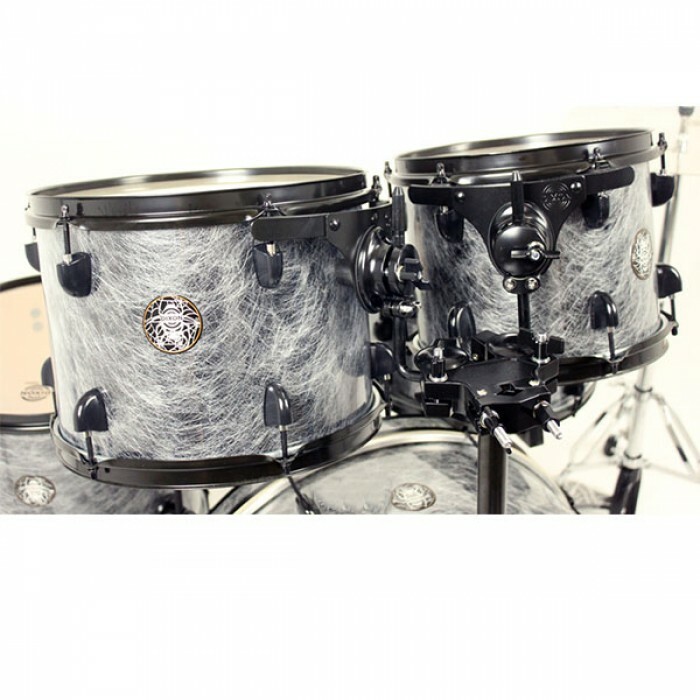 Many of the larger drum manufacturers offer 'signature' drums and whole kits, but there are hardly any who produce sets based around an entire theme. Recent exceptions to this are the excellent Gretsch Renown '57, celebrating the American automobile industry, and Premier's Spirit Of Maiden, inspired by Iron Maiden and notably Nicko McBrain. "The snare sounds surprisingly good - no doubt with some assistance from the batter head coating, which helps to give it a little extra warmth but without stifling its lengthy but pleasant overtone." 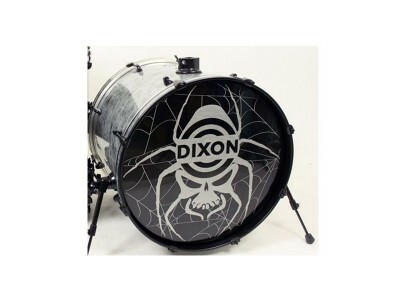 Like these two kits, Dixon's Black Widow is not simply the case of a splash of colour and name designation. 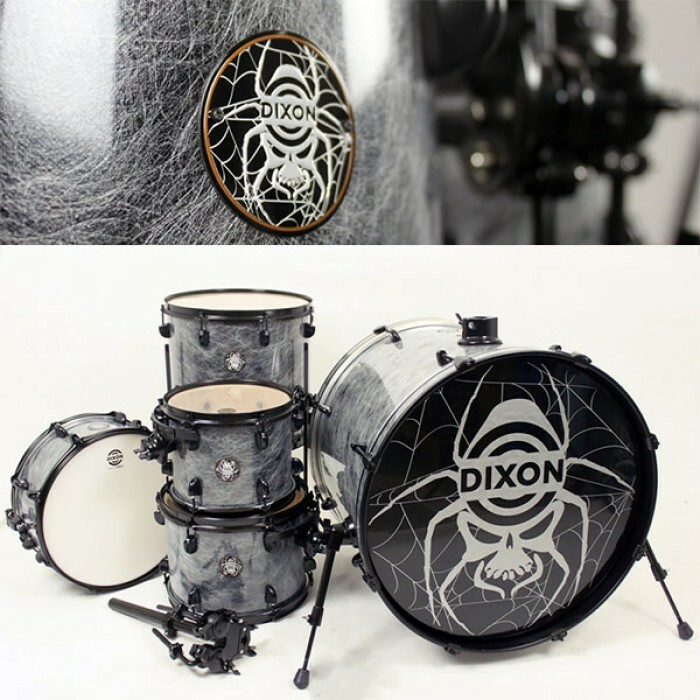 Dixon has chosen a total arachnid theme, with each piece of the kit featuring spidery detailing. This includes the wrap, graphics and even the packaging, which not only has large images of the Black Widow spider (incorporated into the Dixon 'target' logo), but the packaging boxes even have a web-type material which the user has to hack through to get their mitts on their new kit. It's a bit like the frenzy of opening up the Christmas parcels, which Dixon says brings "further excitement" - just in case owning a spanking new kit isn't quite enough. Out from the packaging emerges the monstrous mahogany kick - this has been drilled and fitted with the tom post mounting bracket. 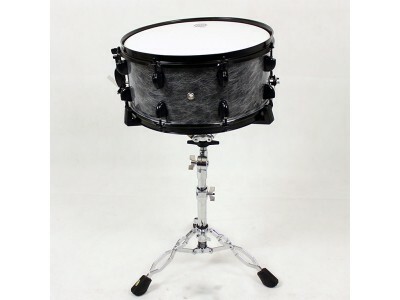 Both of the supplied heads (similarly styled to a Remo Powerstroke), have perimeter-type dampening strips built-in, which should help achieve a tidy bass drum sound straight out of the box. While the batter head is a transparent model, filling up the whole of the front head is a silk-screened Black Widow in silver against the shiny ebony background. 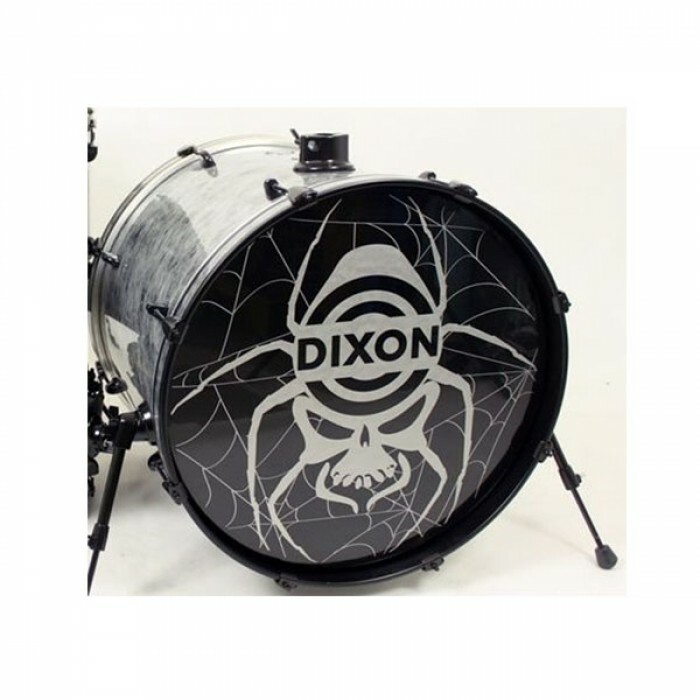 The bass drum counter hoops have a thin strip of the matching web wrap and are each finished with a black trim. 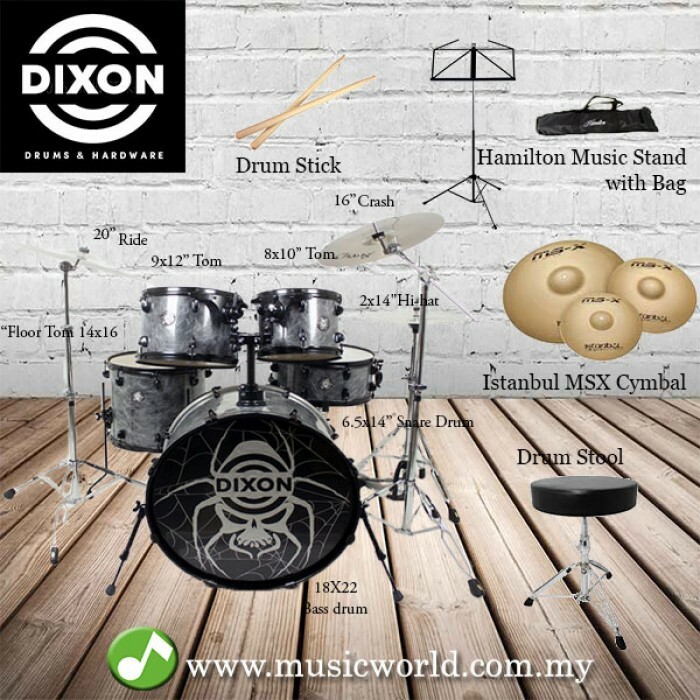 The bass drum claws are made from extremely thin pressed steel and are attached without any form of isolation gasket - this setup looks likely to cause damage to the bass drum rims. The wrap gives the illusion of strands of web, literally 'wrapped' around the outside of each shell. This ingenious finish has been created by embedding strands of glass fibre into the plastic wrap, which will look fabulous under the stage lights with its glassy reflective properties. 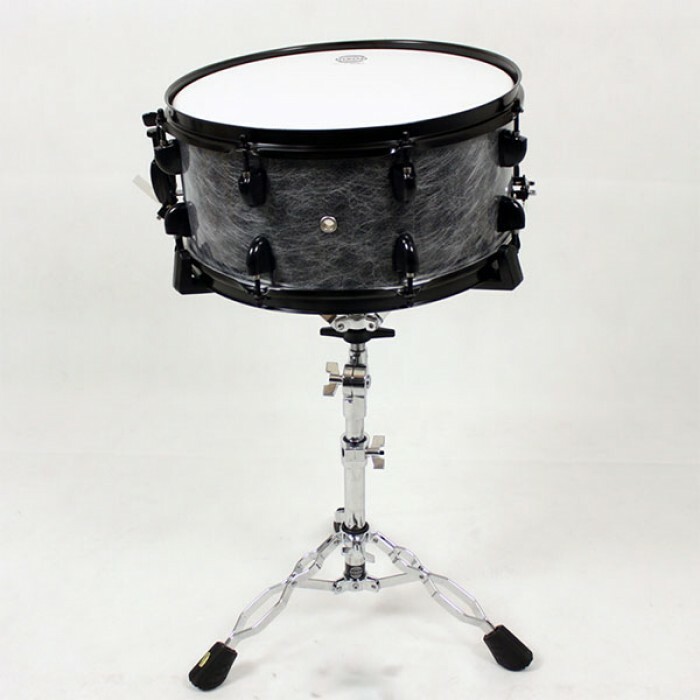 In contrast, each piece of drum hardware including drum rims, low-mass lugs, tension bolts and mini-suspension system of the toms are finished in a satin black. 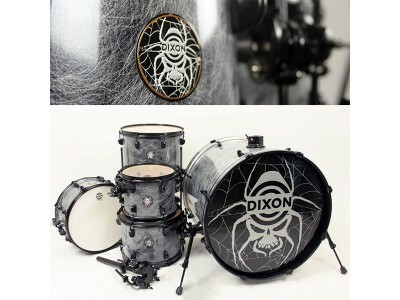 The final arachnid touch comes from the round metal badge with an embossed Dixon Black Widow logo mimicking the front head of the bass drum. To help achieve a warmer, deeper fundamental tone, Dixon has chosen 9-ply shells of mahogany. The shells comprise a chunky 14"x6 " snare, 10"x8" and 12"x9" suspended toms, 14"x13" floor tom and a suitably beefy 22"x18" bass drum. The sizes of the bass drum and snare should ensure this set shakes as well as cuts, but the toms are surprisingly shallow, considering the intended genre. 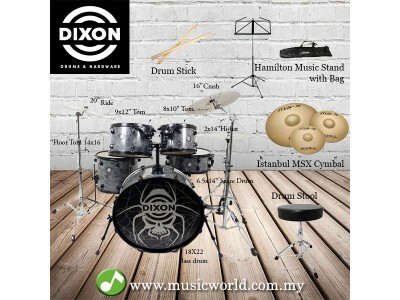 Included for review purposes is a basic hardware set from Dixon's Invader Series, which the company recommend for this particular set-up. 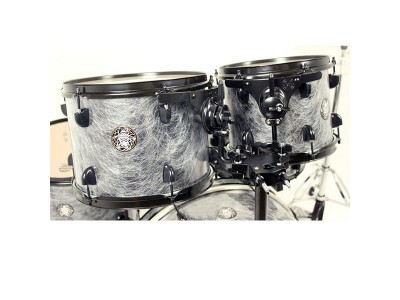 This, like the drum hardware, is finished in black and looks substantial and robust. The hinged tom clamps work effectively in conjunction with the excellent resin ball mounts, making setting up and getting just the right angles less of a performance. Once each drum is positioned and tuned, it's the snare which is the first to be subjected to some 5B wallops. This drum sounds surprisingly good - no doubt with some assistance from the batter head coating, which helps to give it a little extra warmth but without stifling its lengthy but pleasant overtone. Each lug seems to take the applied tension in its stride and operates smoothly. Unfortunately the same cannot be said for the snare adjuster, which feels as if it grinds when making any fine adjustments of the 20-strand snare strainer. the toms slightly more depth while extending the life expectancy of the heads themselves. Having slackened-off the toms as much as dared (without losing too much rebound and causing the heads to flap), the sound is actually much better than expected, with a blend of power and warmth. The bass drum, too, packs a punch (thanks largely to the reasonable heads), with a deep, dark and powerful tone that sounds good from the driving seat.